Greek groups may move back to Bissman and Armington next year as part of a push to utilize housing space more efficiently on campus. Administrators hope to open more program houses and to provide better party spaces for Greek life in the process. Budgetary considerations will play a large role in the decision. The expectation is that the Greek dorms would receive renovations to create more accessible party spaces and that houses Greek groups formerly lived in would receive renovations as well. The decision to move Greek groups cannot be made without first knowing if a budget to make these changes will be available. Lack of party space is one of the main reasons for the change. “The houses aren’t built to have parties in,” said Holmes. The hope is that Bissman and Armington will provide more durable party spaces than the houses currently do. Historically, Greek groups lived in sections in Armington, Stevenson and Bissman. Because the sections that lived in Stevenson no longer exist, Armington and Bissman are believed to have enough space to house all the current Greek groups. “With any luck we’d be putting them back in their historic spaces,” explained Holmes. 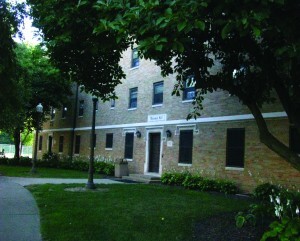 With the Greek groups moving into dorms, the first years who usually live in Bissman and the upperclassmen who live in Armington will be shuffled into new housing. The school has yet to make a final decision, but Holmes believes that the first years will be moved into a different North side dorm such as Andrews Hall, and that the Gault Family School House will primarily house upperclassmen. “The School House adds about 73 beds, so along with the large senior class leaving, we should net roughly 100 additional beds,” Holmes said. Considering that the housing waitlist last year was about 100 people, Holmes expects that even with the Greek groups moving into dorms, there will still be enough space for most people to avoid the waitlist next year. Final decisions about housing will be made and announced some time in January, and the housing selection process has been pushed back to April this year so that students have plenty of time to weigh their options. “We’ll give you two months to figure out what you want to do,” said Holmes. Moving the selection process will allow decisions such as Off-Campus Study and Resident Assistance hiring to factor into housing decisions.